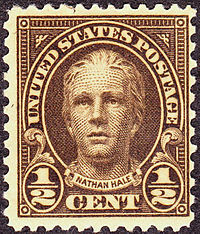 “I only regret that I have but one life to lose for my country” were the last words of 21-year-old American patriot Nathan Hale, who was hanged by the British without a trial on SEPTEMBER 22, 1776. A Yale graduate, 1773, Nathan Hale almost became a Christian minister, as his brother Enoch did, but instead became a teacher at Union Grammar School. When the Revolutionary War began in 1775, Nathan Hale joined a Connecticut militia and served in the siege of Boston.